Lighted Zebra Crossing? Why not? There is a saying that children have a wider imagination then adults, because we usually tend to over think about stuff. Here's an example, how a child's creativity came up with one idea that would possibly be an idea that might actually work in the real world. 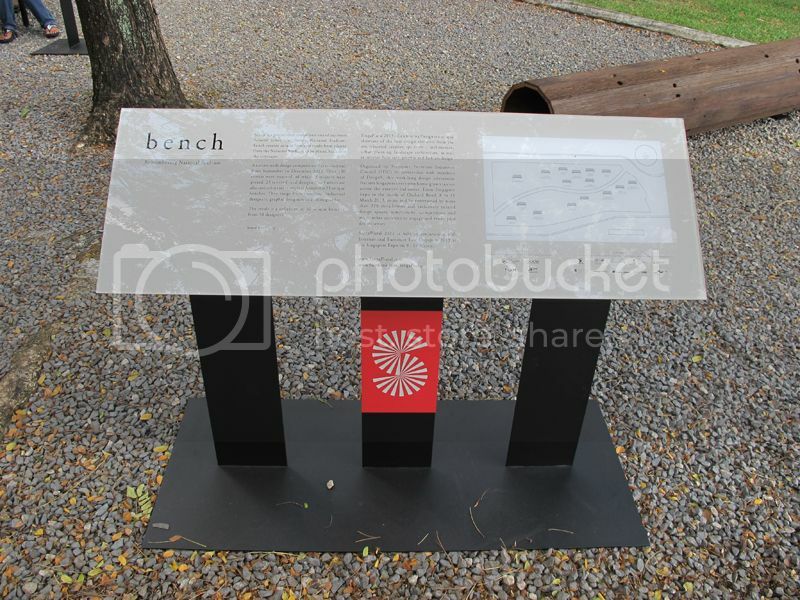 Bench was a one off design competition that allow everyone to remember the former National Stadium by in ways that they only know how. It was a national icon, it has witnessed the glory of football matches, countless of concerts and the National Day parades. Despite the fact there is only one National Stadium, but there are a thousand, a millions of dreams and hopes filling up the stadium in the form of a roar. It was dear to every Singaporean. 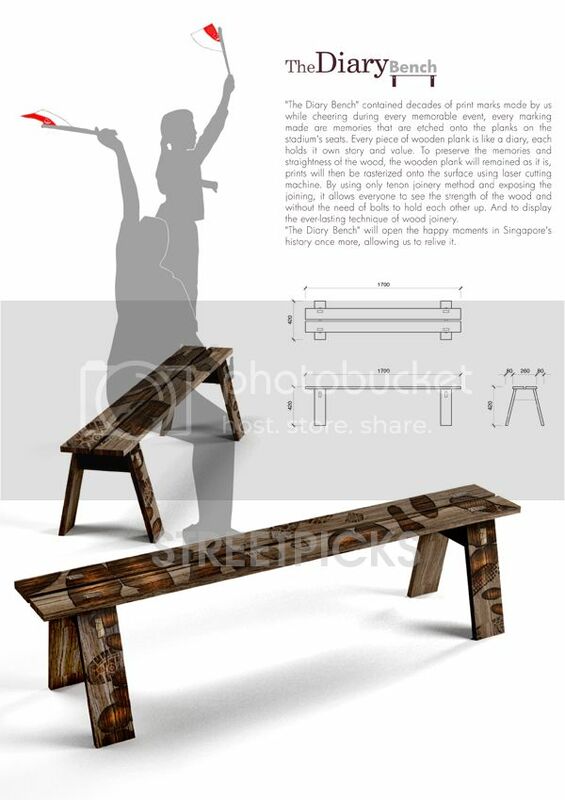 This competition allows everyone to recapture that thought and solidified into a piece of outdoor bench made from the actual wooden planks salvaged from the National Stadium itself. Described by them as a house, an alcove for lovers, a play house for children and offer shades to elderly seeking shelter away from the sun. A gathering point which encourages social or private gathering and interaction. It has a sublime identity that does not distract the surrounding, but engaging the public space efficiently. Despite the events happening in the National Stadium, sitting on those bench during the hot and humid days are similar to a mild torture. 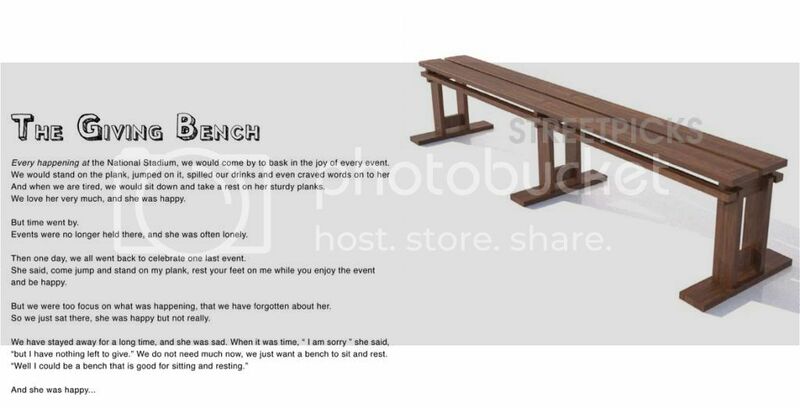 The scale of the bench is in relation to the human's body but hints of a torture rack. His inspiration came from a fallen tree trunk where one would instinctively sit, hence in a way bringing it back to what it once was. To rediscover the spirit of togetherness, to emphasize strength in unity, the need of relying and trusting each other for it to succeed. Through his design, wanted to encourage eye contact as well as communications amongst others. Which is a nice idea, as it was designed to look like the indoor stadium, where everyone will sit facing inwards and people can concentrate on each other instead of being distracted with what is happening on the outside. 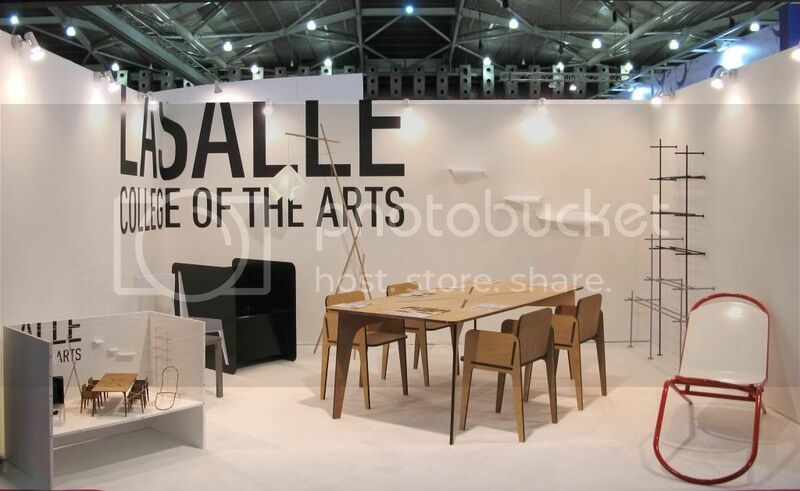 Continuing from the previous post, we made our way to S*cape to check out the Furniture Design Awards 2013(FDA), the 20th Anniversary for FDA and also other exhibitors. NAFA have another booth at S*cape where their product design students create textures from items you can find anywhere. One of the more unique one is the cabbage look alike! But do not be fooled, the student used tissue paper, PVC glue, water and paint to create this. Another exhibitor there was no stranger to our blog, was S U P E R M A M A. Their new collection and a new collaboration with Kihara a Japanese ceramic label called Democratic Society X Kihara Part 1. Left - Right : Tembusu by Desinere, National Bird of Singapore by Relay Room, The Dancing Joaquim by Quiet Studio and lastly, HDB by Chang Shian Wei. Yes its part 1, cause they are holding a competition now to design the next plate that they are going to produce 200 pieces to sell! Dateline is 31st March 2013! so hurry get creative and send in your designs! All the designs you see here can be purchased at S U P E R M A M A at SAM 8Q. 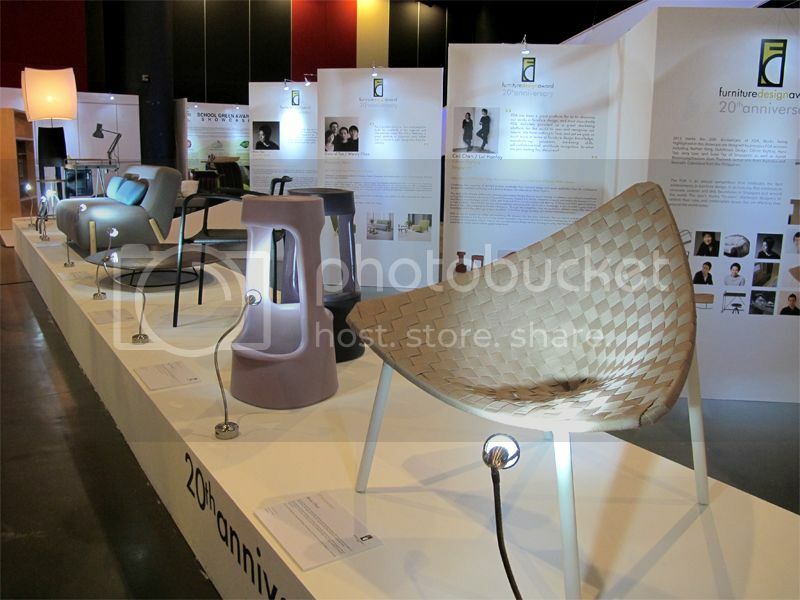 Furniture Design Award (FDA) 20th anniversary showcase of past winners. 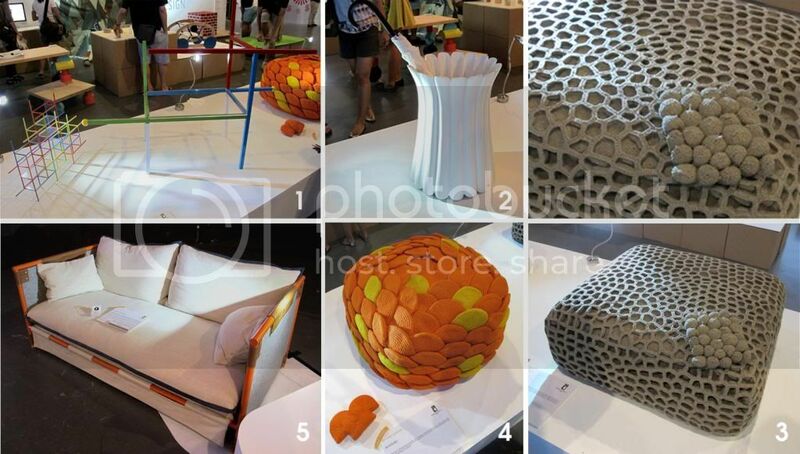 The Furniture Design Award or otherwise known as the FDA. It's every challenging, an every up scaling task for designers. It questioned the role of a designer and makes one thinks deeper into the problem that are affecting lives around us. Today designers are no longer elusive or eccentric that only care about works of beauty, but answering the calls of global problems. And as furniture of today can no longer serves their main function beautifully but to also coexist in our limited environment. The works above are the 5 finalist of the student category, they have applied design to what they have experienced to solve the problems of what the modern world face today. 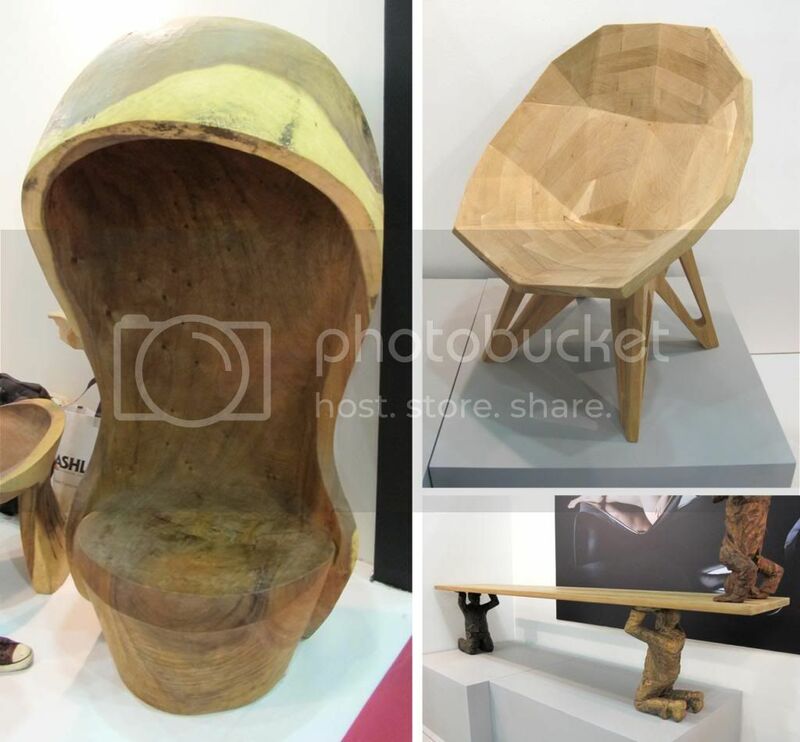 1: The Uni armchair by Wendy Kokaish from Nanyang Academy of Fine Arts. United we stand, divided we fall. It mentions of that no man is an island, and in order to succeed we need to work together. 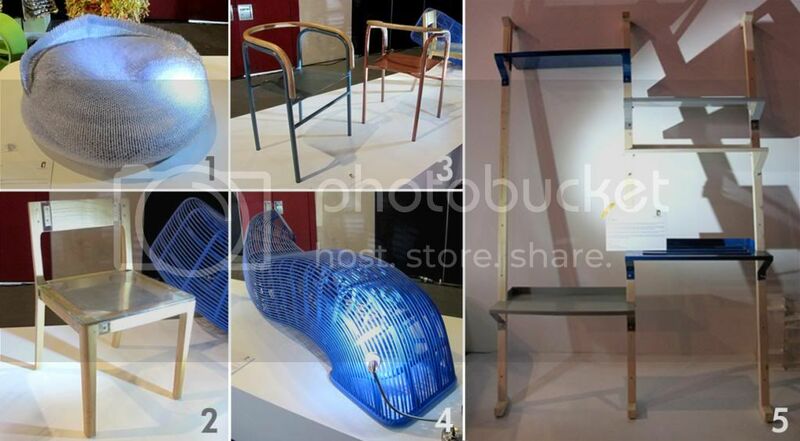 2: Exploded Chair by Denny R. Priyatna from Bandung Institute of Technology. Reminds us that no matter how advance technology has improved. It will always required a skill crafts man to turn the raw and undefined into a piece of product. The deliberation of using clear resin for the back rest and sitting is to allow the user to see the most important part of the chair, the jointing method. 3: Common Armchair by Diaz Adisastomo from Bandung Institute of Technology. It is made of aluminum and rattan. Despite the differences in the type of materials, they both share the common traits of being light-weight, strong and flexible. Diaz was inspired by the similar characteristic and background of these 2 materials and hence, Common chair. 4: Pipe seat also by Denny R. Priyatna. Intrigued by how pipes run through the wall, holes and even underground and even places unknown. Based on that fascination, Denny used rattan and iron pipe to translate that idea into something surreal. It is designed to look like it has no end and even connected to the next room, it is highly adaptable by being able to rotate and be used anywhere. By having it placing next to a wall, greatly increased its value in concept. 5: Co-Axis by Patpimon Onplui of Silpakorn University of Thailand. It addressed the problem of modern home today of having limited space. 1: Gong Shelf System by Min Chen is a modular formulated shelving system which consist of 3 metal sticks that are vertical to one another. This feature allows the shelf to be build and fit into any place or environment. Plastic or metal board that are cut to size can fit in-between the stick to allow the user to put their object above it.Not only that, Gong shelf system enables the user to completely customize it and it leave behind is an unfinished image of an architecture still in progress. 2: Shoehorn Umbrella designed by Sim Miao Ling stand was inspired by the concept of "organization" which is an essential part of our daily life, It is a man's way of keeping things in order. But at the same time, being too organize may result in missing out on certain things. The idea of this design is to create a new perception and new values of organization. Sim Miao Ling observed how do one organized things and seek our new possibility of what can or cannot be organized. Miao Ling also described that how object are placed based on their associated surrounding, or are placed as a result of the transitory human's behavior. 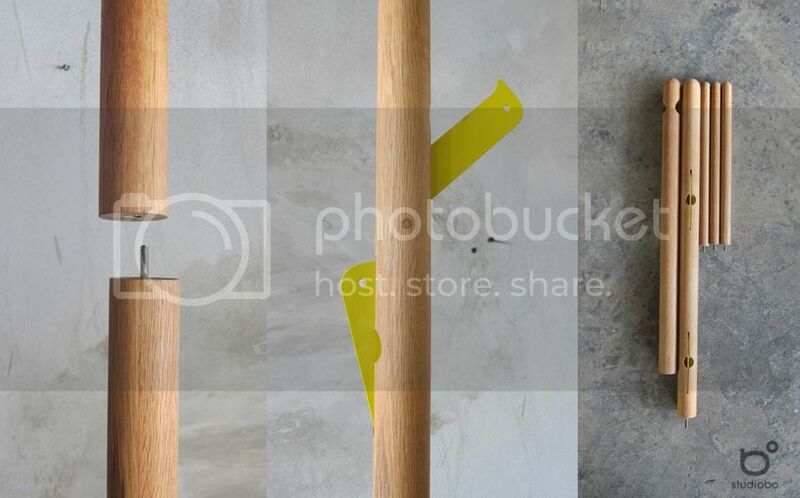 The ShoeHorn Umbrella stand is inspired by how this 2 object, the shoe horn and the umbrella stands beside each other near the door. The multiple curved edges of the umbrella stand allow for a single shoehorn to blend in quietly. Flat disc magnet ensure the shoe horn snaps back into place and stays there. 3 and 4: Artichoke and Hive, crocheted cushions designed by twin sisters Kasia and Monika Gwiazdowska, But in Singapore the designer sisters is represented by their business partner Piotr Saladra. Both the Hive and Artichoke were made by MONOMOKA furniture, and also from the same materials of 100% natural linen or any recycle twine. Despite the many similarities between this 2, Hive was made of of 1,600 pale grey crocheted linen shapes and Artichoke was made of 156 crocheted orange and yellow polyester shapes. And when we gradually think back on how the Artichoke plant looks like, and then their natural color of green. 5: Genterie and Nouveau by George Soo, described that the luxury crowd is becoming younger and savvier, and that whether wealth that are made or through inheritance. And with that success , comes an underlying existentialist angst and increasing social consciousness reverberating amongst a new luxury audience. Genterie and Nouveau was design based on the concept and expressed it through the consideration of material choices and dimension. And the decision down to the very last fabrics of the cushion is also taken into detail and consideration. 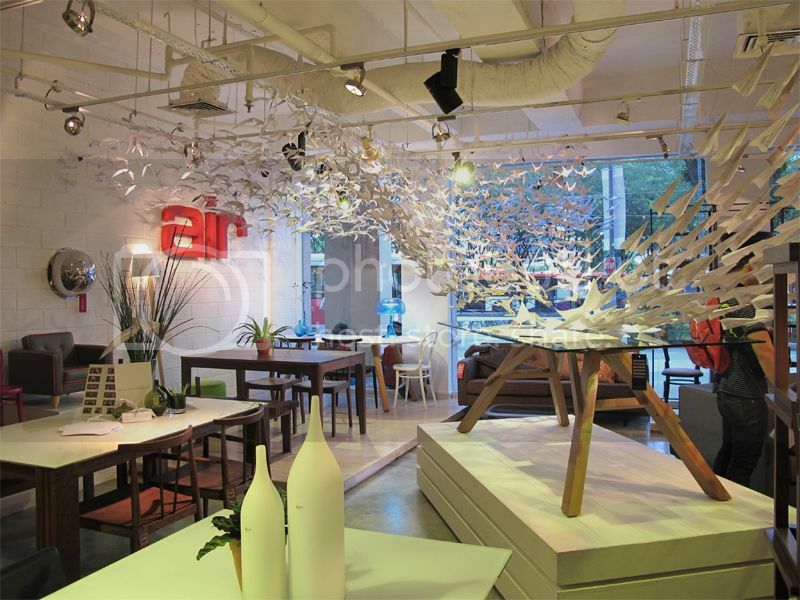 NAFA students folded a total of 1500 paper cranes, and 1500 paper planes using recycled paper in 48 hours! 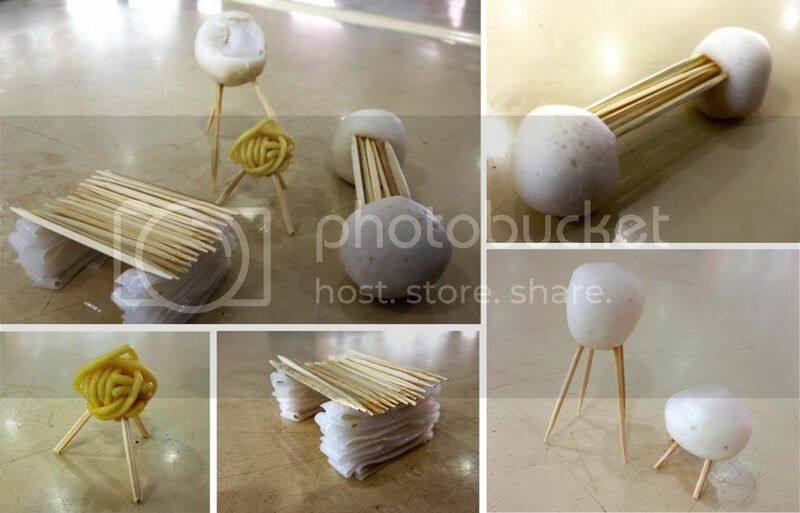 We thought that the Air Divison X NAFA design was the most creative, and we are not just saying that cause we are from that school, but the materials used were recyclables, so didn't have to spend money at all, and no wastage. 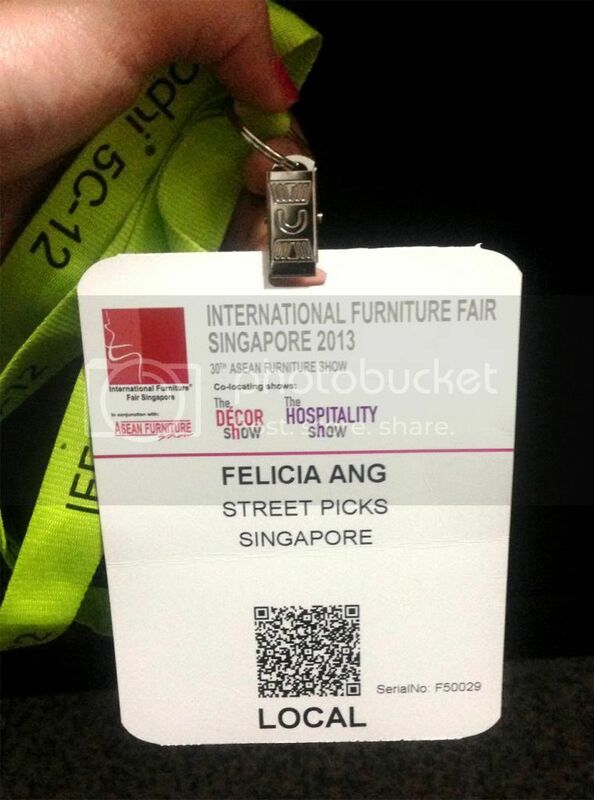 Last weekend, we went to the annual International Furniture Fair Singapore and Hospitality Design Fair 2013! 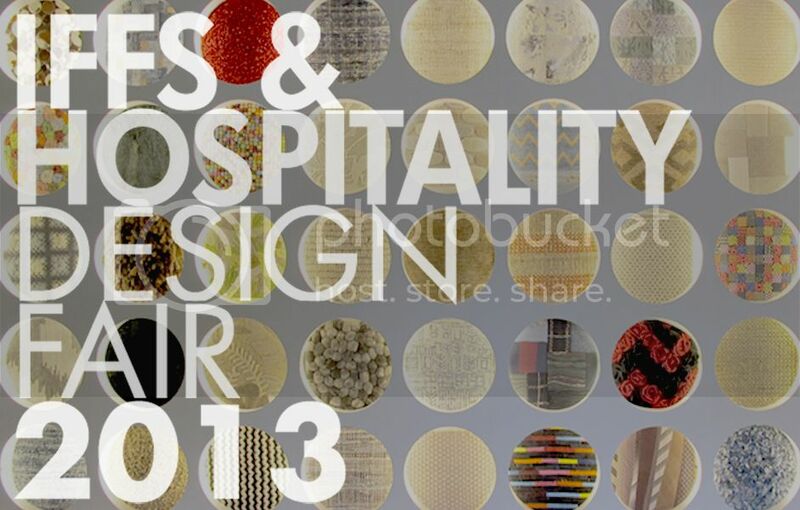 Where different designers from all over the world come together to share tips, design and make new friends. 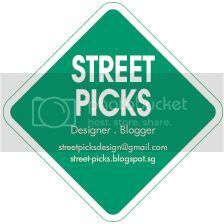 This year, we went to check out the competitions such as FDA, the 48 hours challenge and also how some designers reuse the remnants from our one and only national stadium and turn it into benches. Organized by SFIC and Himpunan Desiner Mebel Indonesia (HDMI), 13 designers from Singapore, Indonesia and Sweden made a memorable journey to Solo City, Indonesia to attend the FutureCraft Workshop. The objective of the workshop was to create new approaches towards modern-day design using traditional materials. They learnt to work with materials such as teak, bamboo, rattan, recycled wood and ceramics. Each designer had to design a piece of furniture using the methods they have learned and incorporate it into their designs. A video to explain more about the FutureCraft Workshop and the experiences of their trip. Where designers from different countries use this space to showcase their designs as well as for schools to showcase their students work! Every year, Nafa would get a booth at platform to showcase their 3rd year students works. We had our chance to showcase our works last year and it was a good experience as we got to talk to other designers from other schools as well as traders. Every year, we are given a theme to work on for our designs, this year's theme was Design is a crossroad of Art and Science where they each picked a scientist to be and from there, use different methods of furniture making to create their designs. Our theme was a Prehistoric Cave cafe, where we had to design furniture that you find in a cafe. Works by Natanel Gluska, He takes a whole tree stump and using only a chainsaw, he carves out these amazing works of design. Despite the advancement of technology in production methods, he sticks to the tools of a craftsman. One of his works, which functions as a sound buffer to the user sitting inside. But we happen to try out that it do not work for everyone. 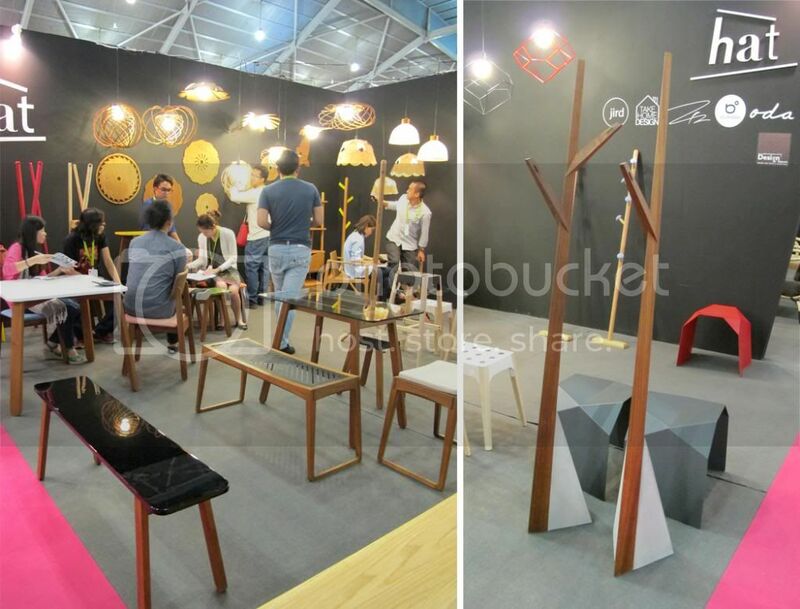 He has a collection called Made in Singapore, consisting of the Long 8, V stool as well as the Kopitiam chair. Moyee, a monster fish ball designed by Jason Goh, was inspired by his childhood memories. He used to play with food, and his grandmother would tell him that the fishball will turn into a monster and eat him. This series called "Makan Time" was done by little thoughts group, inspired by our Singaporean eating habits and traditions. 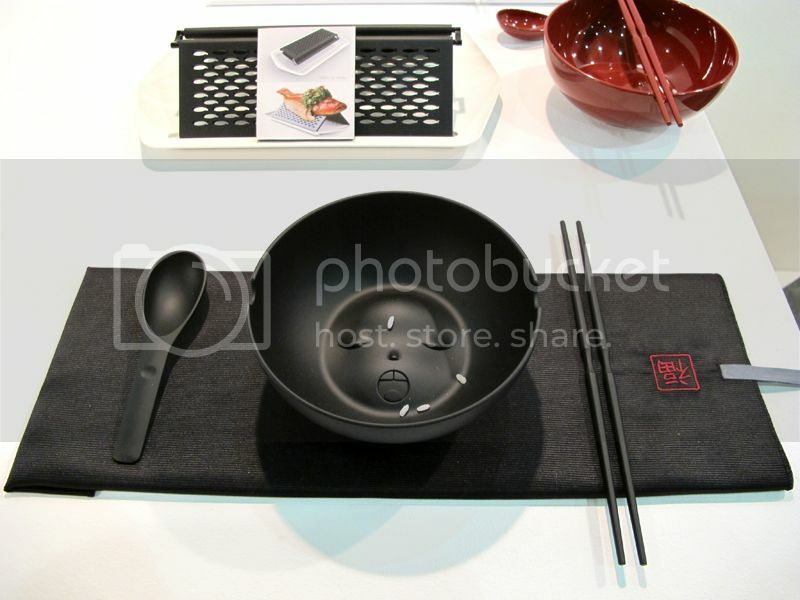 This design consist of a pair of chopsticks, a bowl, spoon, lap napkins and serving plate. And each piece is based on an old wives tales about not eating all your rice or not eating cleanly, you will be "cursed" to be with someone that have pimples all over his/her face, or correct way to hold the utensils and bad habits such as shaking of legs during meals. This design was one that we all could relate to, as it was a breakfast delight that all Singaporean would have come across. 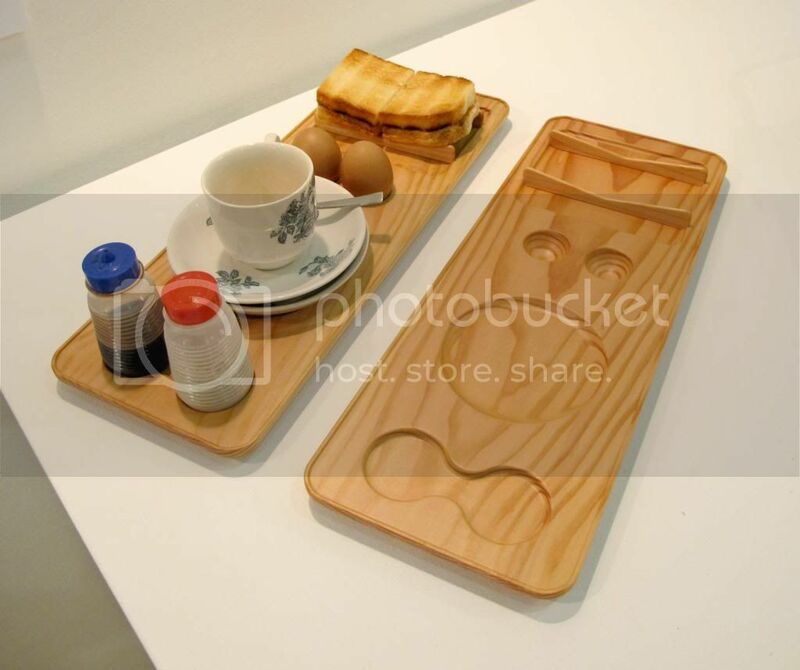 We could enjoy our breakfast all in one tray and allow us to appreciate each of the elements. This mug provides a new experience for Singaporeans as we always tend to hold our spoon with our thumbs while drinking tea or coffee as to prevent the spoon from sliding and poking our face. 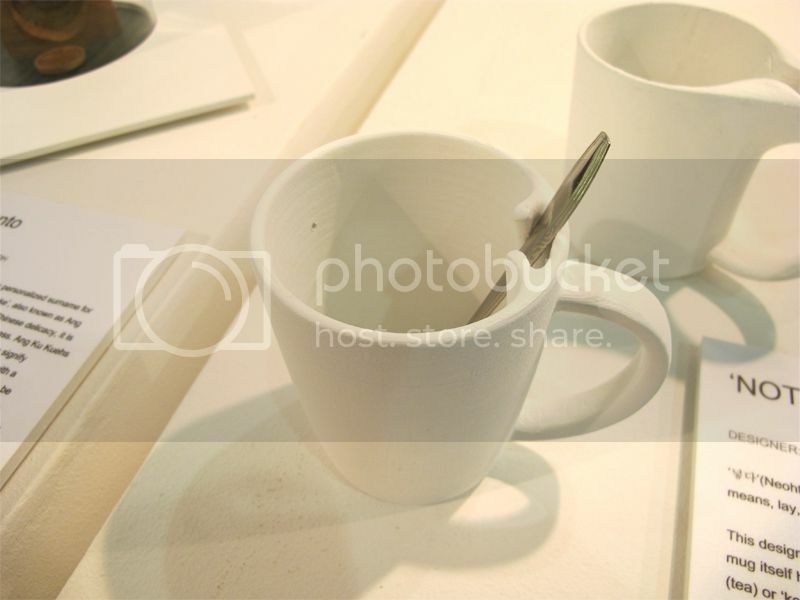 This NOTA mug is designed to prevent the spoon from moving around in the cup and irritating the user. 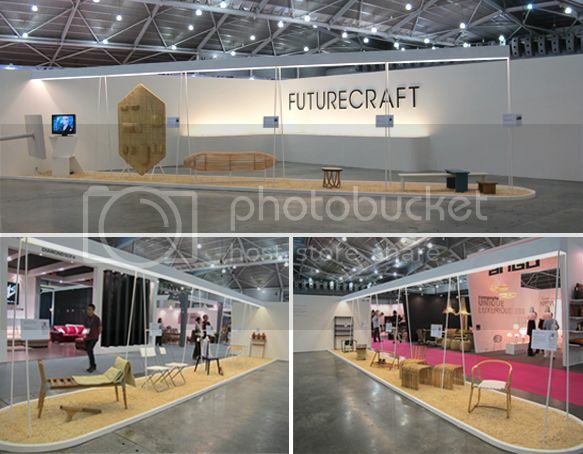 We came across a group of Thai Designers from various design studios that shared an exhibition space. they had many interesting designs that have gained media recognition in Japan. 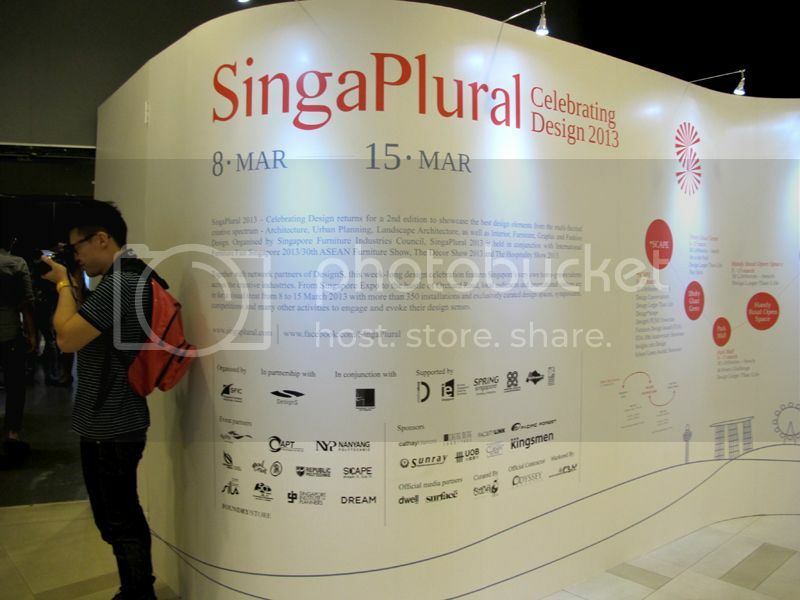 Right: View of their exhibition booth. 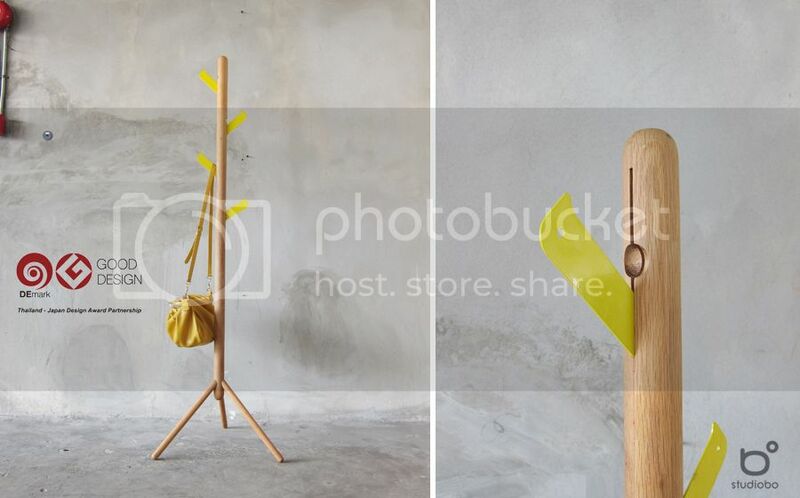 Left: Coat hanger inspired by a plant growing out from under a rock. This coat hanger 'Woodpecker' done by Studiobo stood out immediately when we were looking around. This coat hanger have a unique feature that allows the "hooks" which looked like woodpecker birds to be turned in and out of the pole like how woodpeckers peck holes into the wood. 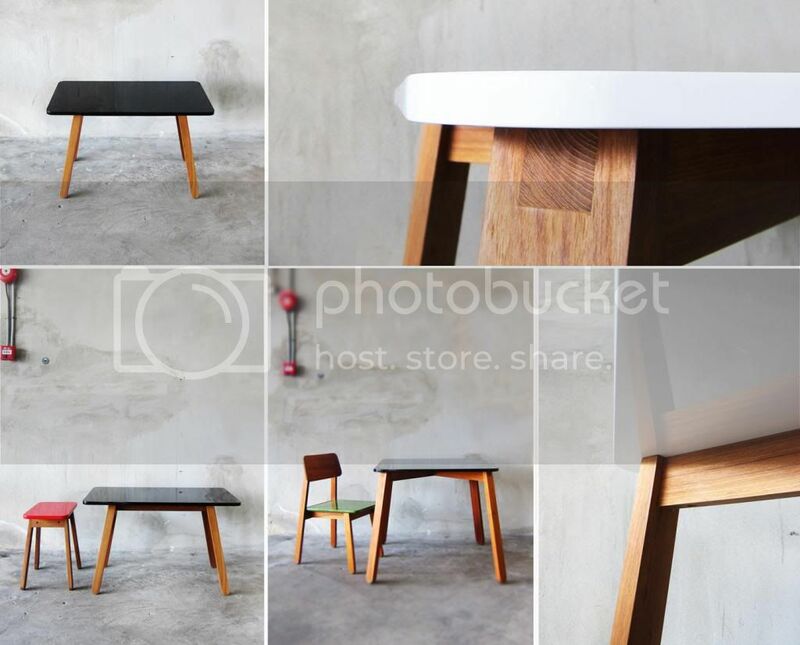 A charming set of table and chairs made of clean lines and of solid colors. Using solid teakwood for the legs yet designed for flat pack shipping and using MDF Hi-gloss lacquered top in various colors featuring pop art look for lively indoor usage. This series of furniture reminds us of the De Stijl movement of the 1917. That's all for part 1 of this 2 part post. Stay tune for part 2 where we cover more on the competitions that are being showcase at S*cape, Park Mall and Dhoby Ghaut Green.